After normal rainfall, overall, in 2009 the first 2 months of 2010, up here in the Dandenong Ranges, yielded 90 mm in January and 44.5 mm, so far, for February (with 1 day to go and rain forecast). The total is 134.5+ mm for the 2 months. This is right on the long term average of 134 mm for these 2 months. Gardens are looking very distinctly better than at this time last year. It gives some hope that the long drought may finally be ending. If true the stress on us gardeners will reduce, allowing us a return to more ambitious gardening projects. Let’s hope the rainfall continues. The Lilium & Vireya show, although no longer a direct ARS activity, did have significant involvement from several ARS members and was a great success. The Ferny Creek hall was filled giving a very colourful display and glorious perfume from the Oriental and Orienpet liliums. 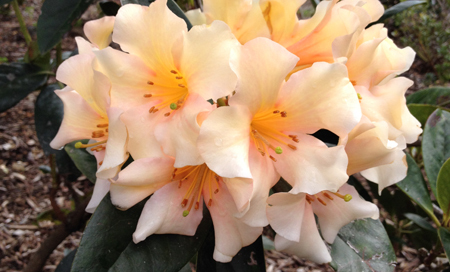 Liliums are a really great companion plant for rhododendrons. They like the same conditions and take up very little space, growing through other plants, while contributing spectacular flowers and delightful perfume. In our garden flowering started in very early December and, as I write this report, there are still many liliums in flower. Coming back to the show, there were many complimentary comments about the standard of the display and the atmosphere. It is hoped, and expected, that the show will grow in popularity as it becomes more established.